Picture provided by Linda van Leuken. The Historic District of Québec is one of the oldest settlements in Canada, and the first to have been founded with the explicit goal of receiving permanent settlement and not as a commercial outpost. It was founded by Samuel de Champlain on 3 July 1608 at the site of a long abandoned St. Lawrence Iroquoian settlement called Stadacona. The Historic District of Québec was designated a WHS because it is the most complete fortified colonial town left in North America, and because as the capital of New France it marks a stage in the modern development of this continent. Québec City was as impressive as I'd hoped it would be when I finally visited in 2011. The city really does feel like a corner of Europe relocated to North America, with an extremely picturesque Upper and Lower Town. I enjoyed the views from the Citadel walls and the Dufferin Terrace next to the iconic Château Frontenac, but the best views of the whole city I found were from the Lévis ferry on the St. Lawrence River and the observatory outside the old city. The historian in me appreciated getting to see sites such as the Plains of Abraham and the historic city walls, since Québec City played a significant role in the 18th century history of the future Canada and the future United States. I also visited the Parliament of Québec, which together with the Museum of Civilization gave me good insights into Québécois identity. Québec City is one of the best World Heritage Sites I've seen in North America, and I would visit it again without hesitation. Logistics: Walk -- definitely walk around the city. There is also a funicular connecting the Upper and Lower Towns. The 2001 Quebec City Tear Gas Festival. Every now and then, even the most patriotic residents of the greatest city in the Western Hemisphere get sick of the Big Apple. So when I saw a flyer posted on the south end of Washington Square Park advertising a bus trip to Quebec City to protest the Summit of the Americas, I was intrigued. Cool!, I thought, Just the thing I need: A weekend trip out of the country! I thought that while everybody else was protesting, I'd take a look at some of the sites and give myself a sorely needed mini vacation. So I called up and made a reservation. Unfortunately, the three day weekend special, which left on a Thursday and included a place to sleep, was already filled up, and the only thing left was the day trip, which left Friday night and arrived back in New York on Sunday morning. That cost sixty bucks, which is pretty cheap for a thousand mile bus trip. I decided to chance it. So at around five-thirty PM, I went to the east side of Union Square and hooked up with the crowd. Here were a bunch of unreconstructed commies if there ever was one. Not that they weren't nice people, I just couldn't have a conversation about politics because of their knee-jerk anti-Americanism. They were all pro-Chinese when it came to the recent crisis and one woman actually said that everything the US government did in the international sphere was wrong. That didn't really matter much anyway, as was planning on sleeping most of the trip. Besides, when it came to other subjects, they seemed to be nice enough. The bus left only half an hour late, and we headed west under the Lincoln tunnel to New Jersey and headed north to find the New York Throughway. If you look on a map, it would seem that basically going there on a right angle isn't as fast as going diagonally through Connecticut, Massachusetts and Vermont would be faster, and it would. But the union made demands and these were leftists, after all, so a right angle it was. The reason for the conference, aside the usual schmoozing, was trade. For years there've been vague plans to extend NAFTA to include the entire New World, and so the Free Trade Area of the Americas (FTAA), which would allow goods to travel freely pretty much everywhere from the Arctic to the Antarctic. The lefties saw this as an evil conspiracy by VERY RICH MEN to take over the world without the consent of the unwashed masses. They HAD to be stopped! They tried to do that when the World Trade Organization had it's meeting in Seattle last year. They managed to slow down that meeting for a short time and did lots of damage to local businesses [which, after all, were run by capitalists and therefore evil] in the downtown area. This was considered by the protesters to have been a great victory and they decided to do the same thing with every other economic meeting they knew about. There were attempts to start riots in Washington DC and Prague, Czechia, and while these for the most part failed, they did cause trouble. Canada is a very polite country and Quebec City is extremely picturesque. Unfortunately, the picturesque part was behind the historic city wall and the fence set up to keep the imported rabble out. My plan had been foiled. I had to hang out with the protesters. The protest was officially called the Second People's Summit of the Americas and when I had gotten there had been going on for a number of days. The people who had organized the event had a huge tent which would house a "teach-in" where a number of speakers would make picturesque speeches prior to the official protest march, where the marchers would march out of town and have a rally around five miles away from where the politicians were. The Hemispheric Social Alliance (HSA), who was running the show and Quebec Public Security Minister Serge Ménard had made an agreement. No cops in the protest area and no protesters in the summit area. Were that to actually happen, all would be sweetness and light. The teach-in wasn't actually a teach-n but a rally where people we down here in the 'States have never heard of, gave speeches denouncing "the rich" for the usual high crimes and misdemeanors, among which were trying to let UPS compete with Canada Post in the package business. Horrors! It was all harmless. Then there was the march, which was mostly Unionists and left-wing organizations holding signs denouncing the proposed FTAA, Canadian Prime Minister Jean Crétean, and the fact that Quebec wasn't allowed in the summit as an independent country. In fact there were so many Quebecois flags flying that you'd think it was their fourth of July. Finally, the parade hit a fork in the road. The parade went to the right and I went to the left. The REAL fun was up near the wall, where the riot was scheduled. In days of old, cities had walls. That was a time when local armies would go around attacking for no good reason and, in fact Quebec had to use it's protective walls back during the 17th and 18th centuries to keep out Indians and British. That's where the action was and so up I went. Rue Abraham, where the street was blocked by the cops and a wire fence. It was all very festive until my eyes began to burn. So I got out some toilet paper from my tote bag and got some vinegar from a person near by to cover my nose and mouth. Someone kindly dropped his or her swimming goggles on the ground and as nobody else claimed them I used them to cover my eyes. Then I saw it, the battle! The protesters were throwing stuff at the cops and the cops were throwing back tear gas canisters and shooting water cannons. I got a really good view and I wasn't close enough to get hit with the water. The tear gas, on the other hand wafted it's way down the street and most of us spectators turned tail and ran. Then we'd go back up to get a closer look. After a couple of times following the ebb and floe, I decided to head to the alternative press center [the "real" one was on the other side of the wall], and see what was going on there. Just people writing and eating peanut butter sandwiches. It was very busy with people inside working and outside recuperating from the tear gas. Then I decided to see if there was another, safer place to watch the festivities. So it's up a few blocks to Rue St. Jean Baptiste, where there seemed to be a huge block party going on. A couple of stores were actually open, but like much of the city, the shopkeepers had decided to stay home and watch it all on TV. The scene on Rue St. Jean was mostly protesters hanging out and partying. There were balloons and beach balls and everyone was having a good time except when some tear gas would waft over from the battle zone three blocks away. The some in anarchist contingent didn't like the state of affairs didn't like this lack of militancy and decided to beat up some of the local press, then they decided to start a fire near the fence, which was a hundred feet from where I stood. I got a clear view of a dozen or so cops looking at the scene and decided that I might be just a little too close, I turned to walk away when the cops lobbed a tear gas canister over the fire and right on the street where I was standing. I got a full blast of the stuff. This wasn't fun anymore. Fortunately, there was a fellow with a canteen and I could wash the gas out of my eyes. I was ready to go home. Unfortunately, due to union rules the driver wasn't going leave until midnight and it was still four in the afternoon. But there was stuff to do. There was free music in the park near where the parade turned right. There was lots of dancing. It would have been nice if there was decent music. According to official reports there were twenty three thousand or so protesters opposed to 6,000 police. Apparently, the protesters were throwing rocks and hunks of concrete. That was not peaceful, and it accounts not only for the tear gas, plastic bullets and water cannons, but for most of the 403 arrests that were reported as well. Most of the people on the bus had gotten gassed, even the bus driver. I guess that's why most of them spent sixty bucks and almost a full day on a bus. The problem is that they know as well as anybody that what they did in Quebec city isn't going to stop anything. The official communiqué was pretty bland, and thanks to a screw up by the communications crew at the summit itself, one of the closed sessions was heard by the press. The presidents of most of Latin America didn't like what Bush was proposing and weren't going to agree to the draft treaty as written. Remember, the 34 presidents and prime ministers attending had been elected democratically more or less, and they weren't merely lackeys of "American Imperialism" like most of the protest leaders made them out to be. Everyone was protecting their own turf. The protesters lost again. But we on the bus left with a sense of triumph. I don't really know why except that we weren't in jail. I'm going back Quebec city someday, this time when nothing of note is going on. Quebec is an amazing city. i have fond memories of the 3 days i spent there. the city was founded in 1608 by a Frenchman; Samuel de champlain. there aren't many buildings in quebec, still existing, from the 1600s, but Quebec has a wealth of buildings from the 1700s and on. most of the old town has been taken up by museums, cafes, shops, and government buildings. not too many people live in the old town. one of the most interesting things I found, is the contrast between the upper and lower towns; they are really quite different. the upper town has more grand/monumental architecture, while the lower town is less spectacular, but has older buildings. i found that i enjoyed walking around the lower town more then the upper town, the culture soaks in more in the lower town. the walls which encircle Quebec are famous (they are the only ones in N. American north of Mexico), and delight to walk along. cannons are placed at various intervals along the wall. the wall walk was one of the highlights of Quebec for me. the chateau Frontenac was built in the 1890s, one of Canada's great railway hotels. this is a magnificent building, easily the most beautiful building in Quebec; and it dominates the town. the Chateau Frontenac can be seen from almost anywhere in quebec. i recommend going across the river to Levis; the views of Quebec are incredible from there. Practical Info: Quebec is a 9 hour drive from Toronto, and a 3 hour drive from montrael. Despite living only 3 hours away from Québec, I have never been to this remarkable city until recently. After having spent a day visiting this walled city, I can conclude that it is definitely worth its place on the World Heritage List. Nowhere else in North America will you be able to see such a city with its unique French taste. Unlike in the bilingual city of Montreal, Québec is almost totally French-speaking! While there in the beginning January of 2007, I managed to visit the citadel on a bilingual tour. From the top, you can see the skyline of the city and the neighbouring city of Levis. It also overlooks the Plains of Abraham. Other places of interest in Québec include the Notre Dame des Victoires chuch, the Notre-Dame de Québec Cathedral, the neighbouring "Musée de l'Amérique française" and of course, the Château Frontenac. Unfortunately, I was unable to visit the interior of either the Notre Dame des Victoires church or the Notre-Dame de Québec Cathedral. I guess this is just another reason to return to this wonderful city! It is celebrating its 400th anniversary in 2008 with many planned events. Note: There has been a long-standing attempt to separate the province of Quebec from Canada. As such, many signs of separatism can be seen here. For example, the Quebec flag is usually flown instead of the Canadian flag. Also, the Legislative Assembly of Quebec is officially called the National Assembly of Quebec. The welcoming sign of the city goes along the lines of "Welcome to Quebec, our national capital." There a very few historic towns on the North American continent, at least by European standards, but Québec is one of them and could easily hold its own in the Old World. 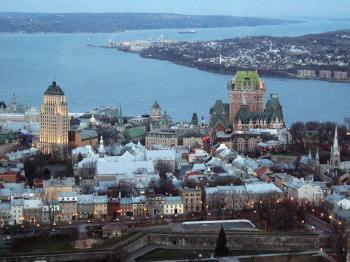 The citadel, the cathedral, all the old buildings like the Chateau Frontenac, cannons everywhere - e.g. on the battlefield of the Plains of Abraham -, even a real city wall (I believe the only one on this side of the Atlantic) give Québec a real medieval feel. Add the fact that this city is about 99% French-speaking and you won´t believe where you are. This city is highly recommended, but only during the warmer months - in winter it must be terribly cold there, even though there is a winter carnival. Could be interesting as well. I visited Quebec at one of the craziest times of the year- January. I remember walking the streets and the temperature was -40 C (including the windchill). I loved the every nook and cranny of the city, its just too bad I wasnt able to explore the city walls because of the snow. Check out the Musee de Amerique-Francais in the old Seminaire (? ), though slightly propagandist, is one of the best introductions of the history of the French in North America. Not on the WHS list but its also worth checking out the Isle de Orleans for a slice of provincial Quebecois life and tasty maple butter spread! Québec: What could i say about the city? Is the right place to fall in love, music everywhere, nice people, the feeling on the air is as exquisit as the architecture, small old fashion streets with flowers outside the houses. What a wonderful feeling to be with someone you love. Quebec City is Europe in North America. The city deserves several days to visit thoroughly and wander all the streets. The citadel and the upper town are lined with 200 year old cannons and overlook the Palais Royal or lower town. This is the kind of town to enjoy by sitting in an outdoor cafe and watching the world go by, people watching on the Dufferin Terrace high above the St. Lawrence River and practicing your french with the delightful shopowners and innkeepers. Quebec City is a bit difficult to categorize. It is superbly French in its architecture and urban design but, it is also the very heart of Quebecois culture: a lively blend of indigenous and European traits. Quebec's location is magnificent, and the towering Hotel Frontenac and Citadel give this city a truly monumental stature. The historic walls and gates, cafe's,churches and museums create an unforgettable ambiance. Spend a week in this place and you will be transported to another time, and another world. 3.0: Walter Daniel Chazad Tevity Tony H.
From "Historic District of Québec" to "Historic District of Old Québec"
From "Quebec (Historic area)" to "Historic District of Québec"
British Military victories over France: Captured by General Wolfe on 18 Sept 1759 after a siege which commenced June 25. Both Wolfe and the French commander Montcalm were killed. Queen Victoria: Queen Victoria helped pay for "Kent Gate"/"Porte Kent" which provides a passageway through the city walls. It was built in 1878/9 during a major reconstruction of the fortifications. She did so in memory of her father Edward, Duke of Kent who lived in Quebec 1791-4. 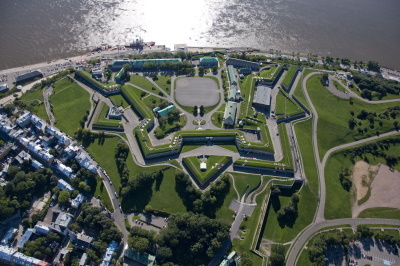 Built or owned by British: Much of the Citadel is of British construction "The Citadelle of Québec is the most important fortification built in Canada under British rules. It was .. built under the supervision of Lieutenant-colonel Elias Walker Durnford. The construction of the outer walls began in 1820 and it took 30 years to finish its construction." and (Wiki) "The existing star-shaped fortifications were built by the United Kingdom between 1820 and 1831 under the direction of Lieutenant Colonel Elias Walker Durnford of the Royal Engineers, and incorporated a section of the French "enceinte" of 1745. Their purpose was to secure the strategic heights of Cape Diamond against the Americans"
Name changes: Two times: in 2000 from "Quebec (Historic area)" to "Historic District of Québec", and in 2006 from "Historic District of Québec" to "Historic District of Old Québec"
271 Community Members have visited.